Founded in 1998, Animals Asia promotes compassion and respect for all animals and works to bring about long-term change. We work to end the barbaric bear bile trade, which sees over 10,000 bears kept on bile farms in China, and, according to official figures, about 1,200 suffering the same fate in Vietnam. Animals Asia has rescued almost 600 bears, caring for them at its award-winning bear sanctuaries in China and Vietnam. Nothing should have to be in a cage. Whether it's a bear or the belief that a beard can be any colour. Lets set both free by donating to the bears and watching me have a pink (or nearest possible colour) beard! 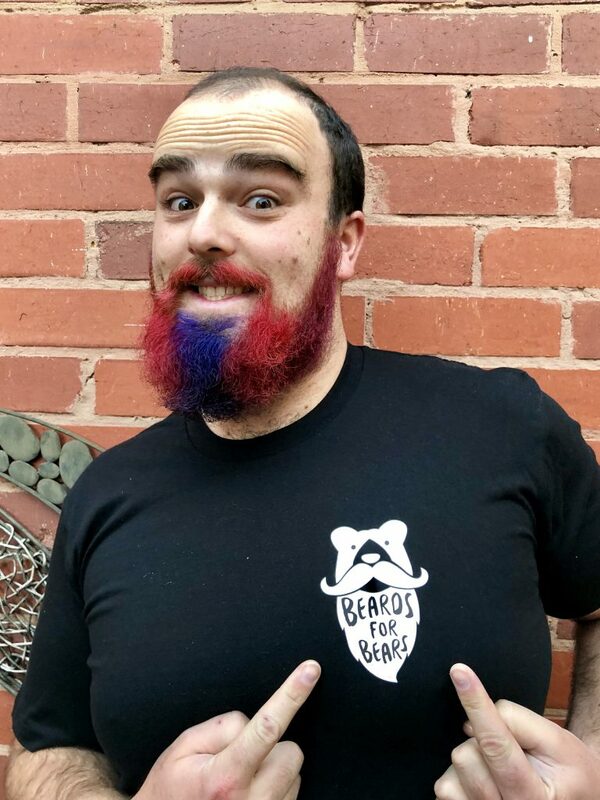 Your donations go towards helping the bears and making me have a colourful beard for the rest of May (and probably ages after that as it'll never come out). The way it works is every time I pass a $500 milestone I have to add another colour to my beard. Make a donation and vote for what colour you want next! From Geoff. Votes for Blue! From Fiona. Votes for blue! From Louise. Votes for Blue! Pink moustache, blue beard. I also vote for the next photo to be the beard in the making goggles, straws and all. Thanks for brightening up the office John. It s a great cause. It s a bit cheap having a red beard and then deciding to dye it red, but it s for a good cause so we ll let you off this time. I would love to see fluorescent green next in the beard. Cheers, great cause! I do like the ranga beard but I think purple should be next. Very hipster. Hi John, I hope you do well with your fundraising. Good for you. I like the colour of your beard. Dorothy a friend of your beautiful mum from art . Well done John! I m with Ellie for a Purple next! I vote purple next! Good on you John! Ronald McDonald eat your heart out! Well done John, I think it s an excellent cause. Thank you for making a difference.